Somehow it made sense to start my blog here. I could have started at the beginning, but which of my beginnings? My relationship with my own mother? My childhood, my young adulthood? Meeting the love of my life, future father of my children, at the age of 24? Marrying him at 27? Or getting pregnant at 28? There are so many beginnings that I could start this blog with but the one that made the most sense was the week that I met my first born daughter. I often joke that my life started the day I met Jakob. But, truth be told, meeting him was like turning the pages of a new chapter in my life. Honestly, it felt like a whole new book. Maybe it’s my atheism, but my whole life I have been acutely aware that it was fleeting and it deserved awareness; conscious decision making and deep appreciation. One life to lead. That at the end of my life, my only life, I’d look back on the experiences that I could still remember, and I didn’t want to look back with regret or remorse. “If only I knew then how lucky I was”, “oh, to be young again”, “what I wouldn’t give to do it all over again”. I don’t want to wistfully remember what was and what could have been. So, by the time I had met Jakob, I had thoroughly enjoyed a young adulthood of being single and independent. I dated and I took nothing too seriously. I focused on myself, my growth, what was offered to me as an individual human being standing on her own. I found success in a career I loved and nurtured life long friendships. Grew roots. Grew wings. So, by the time I met Jakob (a story for another day), I was a strong, confident me. We were drawn together like magnets. The chemistry was early and it was undeniable. There are early moments in our life together that I will hold on to until my last breath. In the end, it’s the simple little everyday moments that make up the most important memories. After 5 years of loving, supporting and respecting each other, we made the joyous and exciting decision to bring a little life into our home. It’s probably best to skip over my pregnancy. Although I kept in relatively good spirits, all things considered, it was borderline miserable. I could never get enough sleep. I couldn’t keep down food (who is the equivocator that named it ‘morning’ sickness? Misrepresentation at it’s worst). I spent Christmas feeling as big as a house. But you could never get the dopey smile off of my face. For whatever I was going through, it was mine. It was my unique experience on one of the oldest journeys a woman could find herself on. I am someone that likes to have a clear idea of next week will look like. Actually, I know what a decade from now will look like. Some that know me might have been surprised by my “birth plan”. The truth is, I have end goals in mind, and I focus on results rather than what is required to achieve that goal. When I close my eyes I can see quite clearly what I want and I keep that image close to my heart. That said, I knew what the results of my birthing experience would be: a healthy, happy baby. In my heart I knew it was a girl - the baby girl I had dreamed of my entire life. Motherhood was unquestionably, always a part of the plan. I didn’t know what would happen on my journey there, but I focused on that rosy baby "end result" of mine. That was my image that would get me through whatever it took to ‘survive’ the experience. Whenever I was asked what I planned and hoped for for my labour and delivery, my answer was ‘a healthy baby’. Nothing more. It seemed to be a relieving answer to the nurses and physicians. I had no expectations or requirements. I just needed my husband and mother by my bed side. It was New Years Day when I went into labour around 10:00pm. After 40 some odd hours of labour, it became clear that my delivery would be much like my mother’s before me. Our bodies were not built for a vaginal delivery - so off to the Operating Room I was, after a nerve wracking moment where the baby’s heart stopped beating. We had an incredible team that encouraged my calm through the chaos. My husband held my hand as the nurses and surgeon tugged away at my completely numbed lower half. We laughed and joked throughout the experience. In what felt like the blink of an eye, I could hear the first screams of my baby. My extremely squeamish husband stood up to watch her take her first breath, held suspended above my open body. By the time that I met her and held her in my arms, I felt like I already knew her. In a way I have. I’ve known her my whole life… I just finally got to meet her. The six weeks following surgery were, at times, hard, of course. I was limited on movement and couldn't drive. I had fantastic pain killers, incredible supportive family and friends, and, in my opinion, I bounced back very fast. 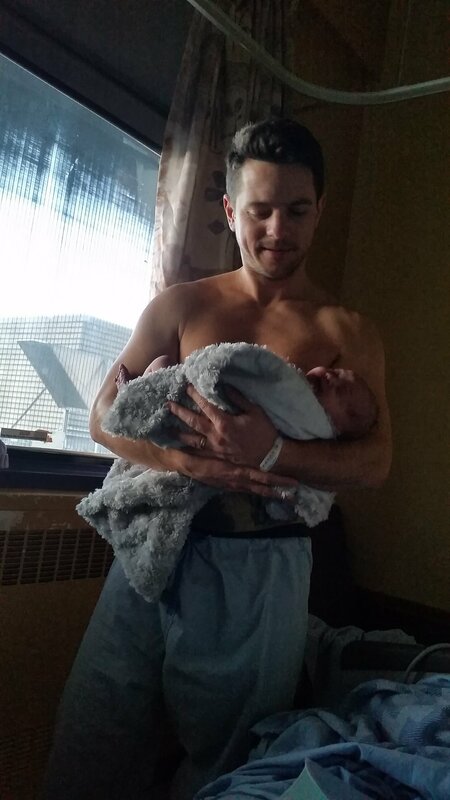 The C-Section was an overall awesome experience for me. Thankfully, since Louella's future siblings will have to come into this world the same way. My advice to expectant mothers? Let go of your expectations. Forget the birthing plan. Give in to nature’s plan for you and listen to your body. You will be given advice… solicited and otherwise. People want to share with you. They have had life changing experiences that they want to talk about. It will be you one day. Listen politely to their anecdotes, be gracious. But know that this is your journey alone. And you've got this, mamma!